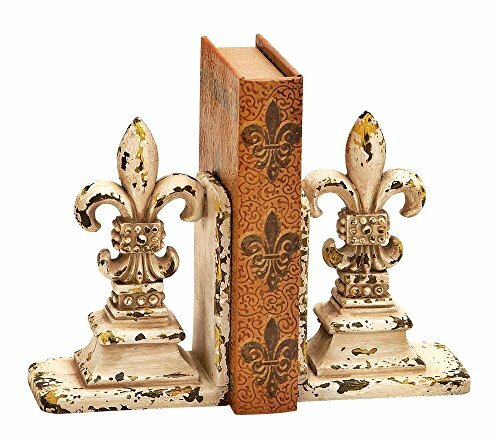 Complete set of two fleur-de-lis adjustable bookends to hold your favorite books. Great size for any shelves. Can also be used to hold CDs, DVDs, and Blu-Rays. Measures 9" H x 5.5" L x 4" W. Bring the centuries-old symbol of perfection, light and life to your bookshelf with this aged fleur-de-lis bookend set. Made from fine cold cast polyresin. Hand-painted distressed finish for an antique look.